Light delivers messages. In particular, it runs through the fibre optics mesh installed around the globe, relentlessly carrying the least and the most important messages that we want to share with each other. In a modern version of the smoke signals our ancestors used to communicate over long distances, billions and billions of “light particles’’ code binary signals. At this level, light seems like a common object, one that we can see with bare eyes and manipulate. Light can speak for us when sounds cannot be transmitting directly, and nowadays this can feel almost natural to a lot of people. Pervading all these communications is the fundamental concept of the information unit, the bit. In practice, bits can be a sequence of zeros and ones, coded into optical pulses. For reasons that will be more obvious below, I will dub this kind of information as “speakable” , meaning that a person (or a machine) can literally speak it out loud, and it will make sense to any person (or processor) receiving it. At the level of this speakable information, light is like a ripple at the surface of a pond. It is a wave that spreads around a point of origin, and can be registered in a continuous fashion. Waves also superimpose on each other and go unperturbed as they cross, as if they actually never did. Seeing light in this way, mirrors are merely changing the course of a wavefront, and indeed all reflections happen simultaneously. Light differs in a strange and unexpected way when one considers its intimate details. In 1905, Albert Einstein proposed that it actually comes in discrete energy packets that we now call photons . This observation was instrumental in the development of quantum mechanics, the theory describing the microscopic behaviour of light and matter. Quantum mechanics has profound consequences. If light comes as discrete photons, how can it look like it is a wave when billions of photons strike the mirror? The answer is confounding: photons travel as waves, but only until they are detected. Said differently: a photon can travel two paths at the same time… until one tries to look at which path it took! A mirror reflecting a photon travelling two paths at once is indeed reflecting two “images” at the same time… but only until something comes in its way (e.g. the eye of an observer) that forces it to randomly show up in one path or the other (but not both). This effectively means that the mirror reflected only one “image” at the time! It is only very late in my academic training that I realized that my question about the mirror was ultimately linked to the very nature of light. This is in fact very satisfying. But at the same time, the wave-like or particle-like nature of photons leads to an even more puzzling scenario. Light can carry “unspeakable” messages. Let me be more precise. A speakable message is something like this: the photon took this path or this one. This is essentially a bit of information. Now, the quantum nature of light means that a photon can simultaneously travel the two paths, and the information remains “unspeakable” (that is undetermined) until it is detected in one path or the other. This is what we now call a “quantum bit”. Taking the concept further, it turns out that two photons can be created in a way that they carry very unique correlations that we call “entanglement’’. The effect of entanglement is this: the result of a measurement performed on one photon of an entangled pair will yield a purely random result, but then a properly executed measurement performed on the other photon will a result that is strongly correlated with the other photon’s result. And the word “strongly’’ might too weak to really explain what happens, as first realized by John Stewart Bell in his seminal work in 1964 (the initiated reader will have already noticed that I am borrowing the Bell’s terminology of the unspeakable correlations ). The correlations that emerge from entangled photons cannot be interpreted as correlated speakable messages , as it was initially suggested by A. Einstein, B. Podolsky and N. Rosen in 1935 . These unspeakable correlations somewhat seem to protrude from space and time. We do not have a simple and fully satisfying explanation for their existence. They do not reconcile with our seemingly speakable, macroscopic existence. As fascinating as this can be, it also leads to a feat. Unspeakable correlations are a resource we can use, and this lead to the emergence of a new chapter in photon-based communication: Quantum teleportation, or the art of teleporting unspeakable messages using unspeakable correlations! Entanglement yields correlations: photons from an entangled pair are intimately linked to each other, and this can be exploited. Let us imagine two persons, Alice and Bob, where Alice wants to sends a quantum bit of information to Bob. If her quantum bit is encoded in a photon, Alice could directly send the photon to Bob… but she could also be more playful and use entanglement instead. So let us imagine that Alice and Bob each have one half of an entangled pair of photons. Thanks to quantum mechanics and entanglement, Alice can perform a special kind of measurement (that we can call a joint measurement) on both the photon carrying the quantum bit she wants to send, and her half of the entangled photon pair. As I said earlier, measuring a photon encoding an unspeakable message will perturb its state, and therefore the joint measurement destroys the state of the quantum bit but reveals no information about it. The unspeakable message might seem lost, but this is not so. Indeed, because the joint measurement included one half of the entangled pair, the correlations are such that the quantum bit now exists in the state of Bob’s photon. There is a condition though: Alice must first inform Bob of her measurement result (she must transmit a speakable message). Even though this result contain no information whatsoever about her quantum bit, Bob can nevertheless use it to recover Alice’s unspeakable message (her quantum bit) in his photon. … and this is one of the marvellous things that we can do with quantum mechanics. After the discovery of the theoretical possibility quantum teleportation in 1993 , it became crucial to show that it was feasible to realize in practice. This happened for the first time in 1997 using photons , it was later extended to several other kinds of systems such as nuclear spins, atoms and solid-state devices . The inventors of quantum teleportation. Top row: Richard Jozsa, William K. Wootters, Charles H. Bennett. Bottom row: Gilles Brassard, Claude Crépeau, Asher Peres. Credit: Claude Crépeau. The possibility of quantum teleportation is now an established fact, and the community is focussing on ways to exploit teleportation for applications. Two fundamental applications are in computing and cryptography . My expertise is in the latter, and I will now try to give you a glimpse of why this is fundamental. Cryptography is the art of writing or solving codes, and is best know as a method to implement confidential communication (of speakable messages). The history of cryptography is a eventful one, and dates back to at least 1900 BC. One crucial observation must be made: the principles behind all forms encryption based on scrambling speakable messages using an algorithmic procedure have been either defeated or otherwise not proven secure against all-powerful eavesdropper. Even to this day, the most widely used encryption methods over the Internet are not known to be secure. Should we panic? It is a good question. We should certainly think about the future of cryptography, especially since we actually know that a full-fledge quantum computer could in fact break one the most heavily used cryptographic methods based on the hardness of factoring large number into its prime factors [7-8]. A solution to the quantum computer threat is quantum cryptography [9-11]. It consist in sending single photons encoding unspeakable messages one by one from Alice to Bob. A careful choice of randomly chosen unspeakable messages (quantum bits) then allows Alice and Bob to generate a provably-secure cryptographic key. The key can then be used to perform unbreakable encryption. This elegant idea has now spun into commercial products [12-14]. The most important limitation of this method is however the maximum distance over which it can be implemented, which is at most a few hundred kilometres when using optical fibre for the transmission of the single photons. Interestingly, one solution to extend the range beyond is to use quantum teleportation of light in a cascaded fashion between Alice and Bob . Recently, my research team and I realized an important step in that direction . We were able to perform a quantum teleportation over 25 km of optical fibre. Importantly, one end of the link had a quantum memory, in our case a crystal capable of storing the quantum state of an entangled photon for some time, and release it for the purpose of synchronizing quantum messages . The teleportation happens from a photon to another one that is stored in the memory, hence we realize a light-to-matter teleportation. Our contribution raises the hope that quantum cryptography over longer distances might be feasible in the near future. 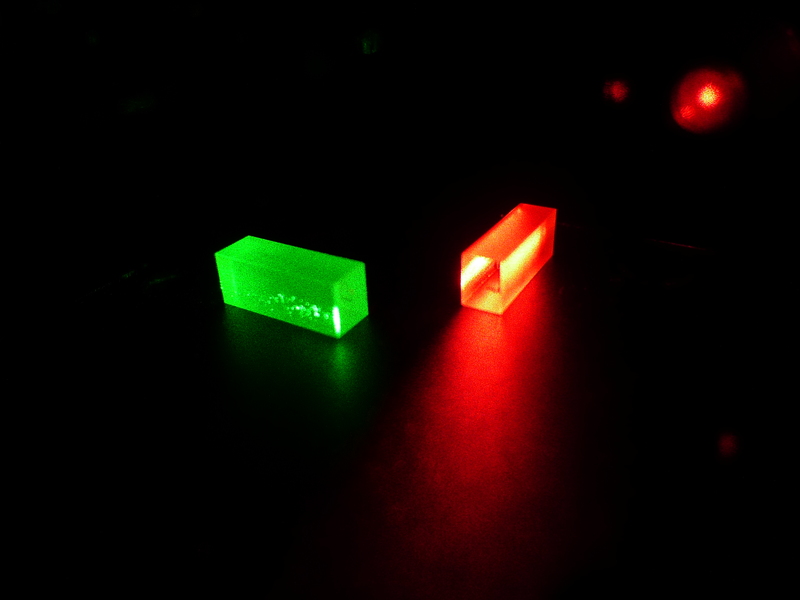 Crystals used as quantum memories in a long distance light-to-matter quantum teleportation experiment . Credit: Christoph Clausen and the University of Geneva. This seems futuristic enough, and one may wonder if it can be used to teleport humans. This would necessitate two identical copies of the same human body, and we would teleport the quantum state of the atoms of the 1st body to the 2nd one. Needless to say, this is an inconceivable task… and I do not know if anyone would be willing to try that in the first place! But it is certainly entertaining to consider the possibility. Quantum teleportation is one of many fascinating and useful feats that quantum mechanics allows us realize or envision for the future of cryptography and computing . Understanding this started with the photon, the simplest, yet perhaps the most fundamental “particle” that led to the development of quantum mechanics. Light is indeed a universal messenger of speakable and unspeakable messages and correlations, and it will most likely continue to play the role of a work horse leading us towards fundamental discoveries, applications and scientific and social enlightenment in a broad sense. John S. Bell, “Speakable and Unspeakable in Quantum Mechanics”, Cambridge University Press (1987). Félix Bussières is a senior researcher in the Group of Applied Physics at the University of Geneva since 2010, where he is leading the research activities on Macroscopic entanglement and on Superconducting Single-Photon detectors. Prior to this position, he obtained his PhD from the École Polytechnique de Montréal in 2010. 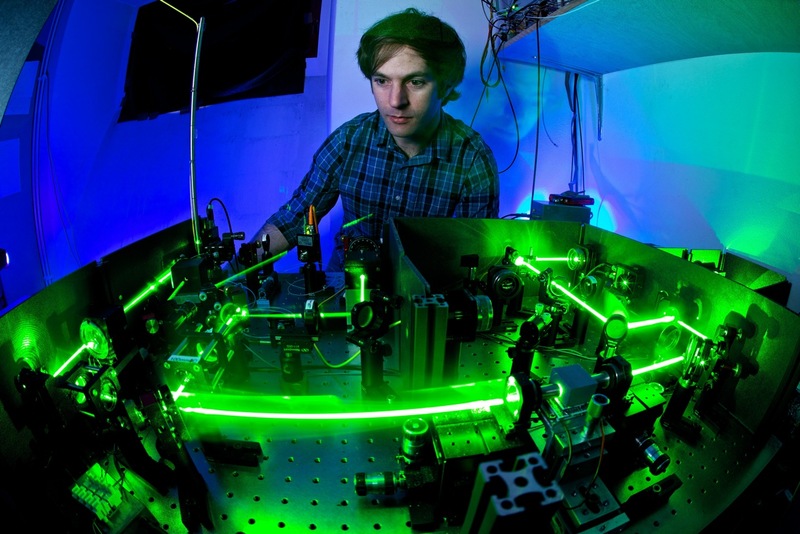 The work of Dr Bussières showed how solid-state quantum memories can be interfaced with photonic entanglement sources. This culminated in the demonstration of several fundamental building blocks of quantum networks using optical fibres, thereby contributing to closing in the gap between academic research and real-world applications.